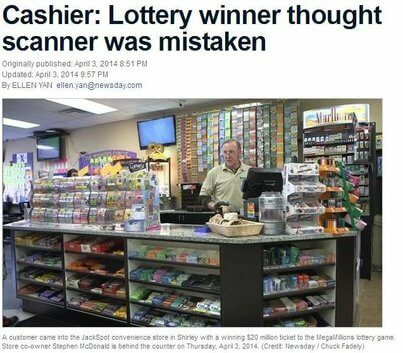 In reality the man was holding the winner of the Megamillions March 25 draw, with a jackpot of $20 million. When the store owner and the clerk told the man, he was shocked. The 48-year old winner who works as an orderly at Southampton Hospital says he will go public only after consulting with legal and financial experts. The ticket sold at the Gascon gas station in Coram pays out $11.1 pretax lump sum, or $20 million in annuity. For now, the man says he wants to keep his job at the hospital.